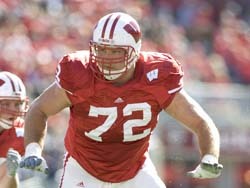 Badger offensive lineman Joe Thomas is still happy he went fishing on Saturday and not to New York for the NFL Draft. The media ended up following Thomas out to his fishing trip and he did many of his post selection interviews from the boat. Thomas says that he hopes to sign quickly and he hopes to start right away.